Serendipity in travel: Why you should ditch Yelp and Google Maps. True travel exploration requires that you ditch Yelp and Google Maps. 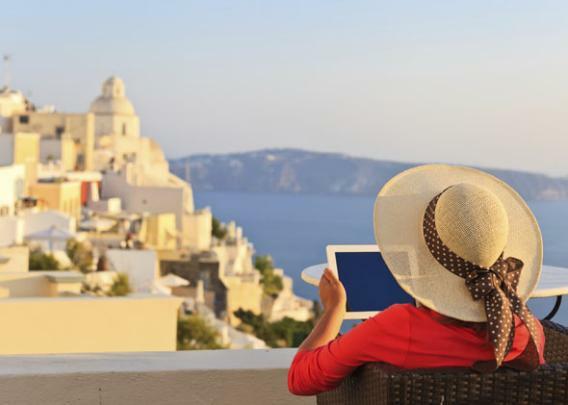 You might enjoy Santorini, Greece, more without all the help from the Web. Over where? Into oblivion. Into awkwardness. Into, well, I didn’t know, because my smartphone didn’t tell me to “go over there.” For all I knew, we were going to be robbed, car stolen, and left for dead somewhere “over there.” Still, we followed the dirt road, guided only by worn signs pointing to a hotel. Of course, you know how this ends. After a half-mile, we found ourselves at a postcard-ready Tuscan hotel with spectacular, unspoiled views and a lonely but exceptionally helpful waiter who served up two sandwiches and glasses of wine, even though it was between meals and he should have been pressing napkins. We had an entire veranda to ourselves for the afternoon. It was lovely … over there. This happens a lot on our vacations: “Hey, let’s go there,” says she, with no guidebook, no Yelp, no Google Maps. No, say I—we should follow the schedule, consult a book, go online, anything to ensure that I don’t have an unexpected experience. I want to know what I’m getting myself into. Isn’t that what makes travel in the Facebook age so great? To fly thousands of miles on a plane only to stay in the curated bubble of your social graph? The wisdom of my crowd can guarantee a good experience. Sure, I don’t know the folks who post reviews on Yelp or even those who pen the Frommer’s guides. But I have trusted those sources because, over time, I have recognized they like the same things I like. I don’t log on to the travel site smokers-united.com, because I don’t smoke. I don’t buy any of the “Haunted Travels of the …” books because I don’t like haunted anything, anywhere. I’ve self-selected my guides to make sure they will bring me the familiar, free of surprises, free of mystery, free of accidents. That, you should be thinking by now, is not exploring. That’s two steps removed from a cruise, the pinnacle of mystery-free travel. Technology does make it easier for us to travel; my GPS saved us countless hours and lots of gas money (though it did navigate into a few Clark Griswold moments, like the time I was lurching my stick shift through an 11th-century piazza filled with gelato-eating tourists pushing strollers). But if you can write it all down in Evernote before you leave your house, and then slavishly follow the Yelp recommendations, are you missing out on the serendipity of travel and life? Imagine telling your friends upon your return, “Yep, went exactly as planned, nothing we didn’t expect.” They’d look at you like you were a project manager, not someone on vacation. Memories are made by war stories like that Clark Griswold story above, not from flawless checklist itineraries. Of course, you could instead use money, instead of technology, to guarantee certainty. Stay at a first-class hotel, ask the concierge to buy you special access tickets to all the attractions and book the best tables at the best restaurants. But that’s not much of a quest, either. That’s never leaving Eliteistan, the rarefied, and to some degree monotonous, world in which the wealthy walk from business-class cabin to town car to top-tier-but-still-chain-because-they-know-it-and-get-points hotel to Starbucks (because no one else can make a double-vanilla chai latte the way they can, and why risk it?). Forget the social graph bubble; that’s the same daily routine of brands whether they’re in Rome, Buenos Aires, or San Diego. The perfect-English tour guide who whisks you to the elephant farm in a cushioned Range Rover doesn’t connote “exploration” so much as “theme park.” I met one very nice American couple moving so fast on a here-today-gone-the-next-minute guided tour that I doubt they even knew which town they were in. If it’s 2 p.m., it must be San Gimignano, or wait, is it Florence? OK, sure, sometimes you just watch to veg out and read on the beach. But we travel to travel, to see new things, get out of our routines and expand our brains. Little more than a century ago, only the rich traveled, and normal people like me flocked to World’s Fairs, which brought the Earth’s rare charms to the United States. It was a zoolike atmosphere, but those folks were craving the unfamiliar sights from around the world. Your inheritance of that spirit shouldn’t be buying a ticket to a theme park safariTo meet people who weren’t expecting to see an American today is a rare joy, an authentic moment when two cultures share and grow. When we talk about exploration travel, we typically conjure up an image of a cave in Belize or a Himalayan peak. But equally important, if not more, is the bowl salesman in Bangkok who knows just enough English to tell you about his America-bound niece and asks a lot of charmingly uninformed questions, and you provide the kind of guidance to save him money and his niece embarrassment. Or the waiter in Sunyani, Ghana, who complains about paying his local “king” rent, kicking off a long conversation about cultural differences and why it’s hard to get a business off the ground under those rules. If you’re just doing what everyone else is doing, then you might as well stay home. Even Mount Everest has been ruined by the crowd. Not to say “Hey, let’s go over there” guarantees success. On the same trip, that sense of adventure put us in front of a gummy, gloppy plate of pasta in Rome. It also wasted a lot of time, with dead-ends and disappointments. Even that, however, is part of the exploration. As the travel writer Tim Cahill put it in Hold the Enlightenment, “boredom greases the cogs in the machinery of marvels.” While Cahill was talking about having to wait eight hours for a plane in Bujumbura, Burundi, it applies to the side streets in Florence, for us wussier travelers. If you want to see something amazing, there’s a price to pay in patience and occasional frustration, but it’s worth it. The surprise-free life is a hallmark of the modern Web. Your entertainment can be self-curated. (Millennials find it absurd that there was a time when you had to watch whatever was on TV then, take it or leave it.) Your diet can be self-curated. (Why walk down a street and just pick a restaurant when Google Maps will give you the Zagat ratings?) And, of course, your news can be self-curated. As Cass Sunstein noted recently, that kind of self-curated news pushes us to extremes, echo chambers of our own making, whereas serendipity is a “social glue,” bringing us together by common, accidental experience. It doesn’t have to be that high-minded. Getting over your instinct to structure your time leads to so much more fun. Accept that two of three times will be strikes, but if the third time is a hit, then it was worth going up to bat. The wonders of the world await your accidental arrival. More from Slate’s series on the future of exploration: Is the ocean the real final frontier, or is manned sea exploration dead? Why are the best meteorites found in Antarctica? Can humans reproduce on interstellar journeys? Why are we still looking for Atlantis? Why do we celebrate the discovery of new species but keep destroying their homes? Who will win the race to claim the melting Arctic—conservationists or profiteers? What can exploring Google’s Ngram Viewer teach us about history? How did a 1961 conference jump-start the serious search for extraterrestrial life? Why are liminal spaces—where urban areas meet nature—so beautiful?